Located on 55 acres of forest, pond, and open land on the UMD campus, the Bagley Nature Area is an outdoor learning “laboratory” and recreation spot for students and faculty. In the past, classes were conducted on the site without any protection from weather. The new classroom pavilion provides a flexible venue for all types of learning experiences from science and environmental study to sports activities. The building is one level above grade and uses conventional wood framing. The sloped roof consists of typical construction materials including prefabricated wood roof trusses. Masonry-enclosed piers, at approximately eight feet on center, support the roof framing. A continuous concrete grade beam at the perimeter supports the piers and transfers structural loads to the earth. A detached reinforced masonry fireplace chimney, approximately four square feet, extends 18 feet above grade. 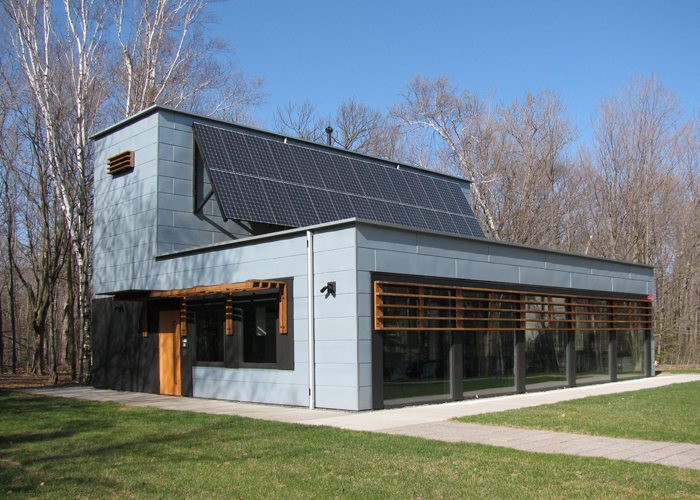 The building met LEED Platinum certification and German Passivhaus criteria, with sustainable features such as passive solar heating, high efficiency heat recovery ventilation, and onsite wastewater treatment.